eBay Motors driver Colin Turkington secured his second consecutive victory at Rockingham, this time leading the contest from start to finish. MG KX Clubcard Fuel Save again filled the remaining podium positions but this time it was double champion Jason Plato who led home young team-mate Sam Tordoff. Turkington’s BMW 125i M Sport blasted off the line and away from the rest of the pack on the run down to Deene for the first time. Tordoff was gobbled up by Plato initially and then lost out to the fast starting Chrome Edition Restart Racing VW of Alain Menu. The WIX Racing Mercedes of Adam Morgan nudged Andrew Jordan’s Honda Civic wide while Gordon Shedden’s Tourer skipped across the grass behind. Tordoff repassed Menu on lap three, who also had the Airwaves Racing Ford Focus of Fabrizio Giovanardi closing in. In a reversal of race one, however, his team-mate Mat Jackson made contact with the rear of the Italian’s Focus as the double champion’s race began to unravel. Shedden was busy putting in a solid recovery drive after his early off but he couldn’t match the pace being shown by the Exocet Racing Audi A4 of Rob Austin and soft-tyre shod Civic of Jordan. The reigning champion scythed past both Menu and Jackson in the first instance before Austin repeated the trick late on. When the dust settled it was Turkington who won comfortably from a fading Plato and Tordoff, with the latter having to defend his team-mate as Jordan closed in at an alarming rate. Austin took fifth ahead of Menu with both now starting the reversed grid race three from the front row. 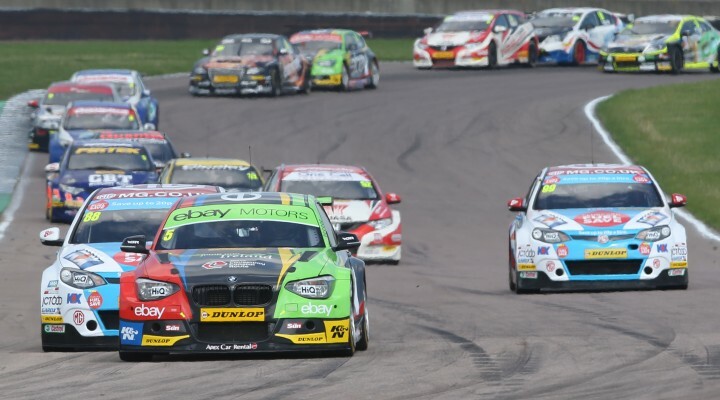 Shedden held on to ninth by just 0.203s from the second eBay Motors BMW of Rob Collard whilst Hunter Abbott produced a sensational driver to claim tenth – his best ever result in the BTCC. Incredibly after problems in qualifying Abbott started race one from 31st on the grid. From there he hauled his Alcosense Breathalysers Racing Audi A4 to 14th, before going to improve by a further four places in the second bout. The final race from Rockingham will take place at 16:40 with the action being broadcast live on ITV4.